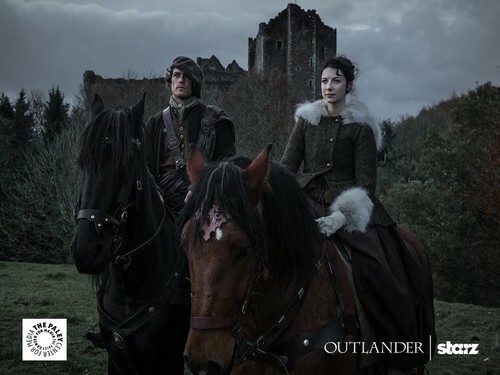 Outlander Season 1 Promotional Picture. . HD Wallpaper and background images in the serial tv outlander 2014 club tagged: photo outlander season 1 jaime fraser claire beauchamp sam heughan caitriona balfe. This serial tv outlander 2014 photo contains wrangler kuda, wrangler, kuda wrangler, jejak kuda, horse trail, lintasan kuda, kuda pacu, pacuan kuda, bangtail, and balap kuda.